The New Seekers released 29 singles in the UK. Lyn Paul sings on 16 of them, including all six of their Top 10 hits. If any of the New Seekers' singles are missing from your collection, then why not try finding them using our On the Net guide to record collecting? Check the other Sound and Vision pages for information on the New Seekers' other recordings. The New Seekers first visited Australia in 1970 and toured there again in November 1972. 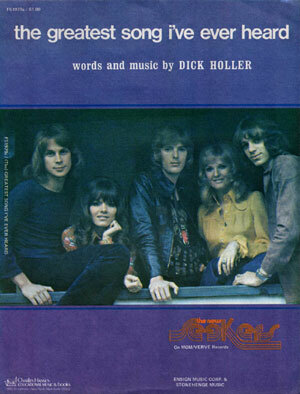 Although two members of the group (Marty Kristian and Peter Doyle) had both been pop stars in Australia in the mid '60s, the New Seekers association with the original Seekers (who came from Australia) meant that Keith Potger's new group would never be taken to Australian hearts in the same way as his old group. It is hard to provide definitive chart placings for the New Seekers' Australian singles. Go-Set magazine published a national Top 40 chart from 5th October 1966 to 24th August 1974. From May 1974 through to 1988 music enthusiast David Kent published The Kent Music Report, a weekly record chart of Australian singles and albums. He later published retrospective charts covering 1940–1973 using state by state chart data obtained from various Australian radio stations. From 1987 The Kent Music Report became known as the Australian Music Report (AMR). In addition to these two charts there's data from The Book: Top 40 Research by Jim Barnes and Stephen Scanes. The 9th edition of this book covers 60 years of Top 40 charts in Australia (1956-2014) and gives a third set of chart placings. Take your pick! Note: the Go-Set chart ceased publication while I Get A Little Sentimental Over You was still enjoying chart success. Undoubtably the single would have enjoyed a longer chart run had the chart continued.